After leaving Gen. Richardson the party passed a house in which was a large number of Confederate wounded. 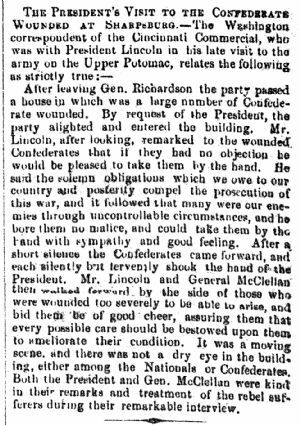 By request of' the President, the party alighted and entered the building, Mr. Lincoln, after looking, remarked to the wounded Confederates that if they had no objection he would be pleased to take them by the hand. He said the solemn obligations which we owe to our country and posterity compel the prosecution of this war, and it followed that many were our enemies through uncontrollable circumstances, and he bore them no malice, and could take them by the hand with sympathy and good feeling. After a short silence the Confederates came forward, and each silently but fervently shook the hand of the President. Mr. Lincoln and General McClellan then walked forward by the side of those that were wounded too severely to be able to arise and bid them be of good cheer, assuring them that every possible care should be bestowed upon them to ameliorate their condition. It was a moving scene, and there was not a dry eye in the building, either among the Nationals or Confederates. Both the President and Gen. McClellan were kind in their remarks and treatment of the rebel sufferers during their remarkable interview.